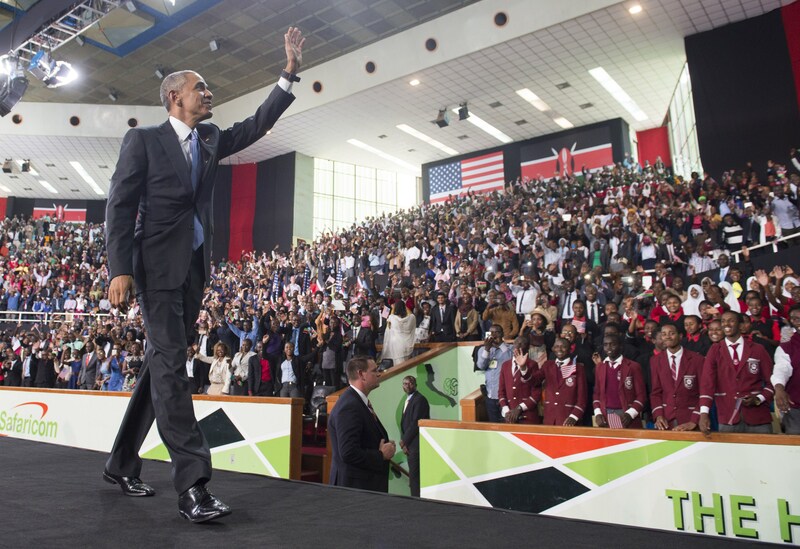 President Obama took a little getaway to Kenya, his ancestral country, this past weekend. When you're on Air Force One, any trip to Africa is just a quick jet-set, right? But this particular visit was no casual jaunt. With his visit to Kenya, Obama became the first president to make the trip to the East African country. And after his monumental visit, the president had several camera-worthy moments. From making historic speeches to getting down on the dance floor, the photos of Obama in Kenya are truly worth perusing. With deep family roots in the country, Obama referred to himself as "Kenyan-American" and dined with three dozen family members, where he sat between his step-grandmother Sarah Obama, whom he calls "Granny," and his half-sister Auma Obama, reported the New York Post. Though he was meeting some of these family members for the first time, this wasn't the president's first visit to Kenya. Thirty years ago, the president made the trek wearing just "jeans and a backpack." This trip to Kenya was a little less casual, as Obama addressed the nation from the perspective of a world leader. In his parting speech, the President addressed the crowd what The New York Times called a "tough-love message." The president made the pointed comment that "Kenya is at a crossroads" when it comes to progressive change, and as he talked specifically about LGBTQ rights among other issues, he reminded residents of his ancestral country that he is "a friend who wants Kenya to succeed." Here are some snapshots of that friendship playing out over the course of Obama's Kenyan stay. Did you think Hillary was the only one who knows how to get down in (South) Africa? Think again. Obama brought his moves — and his wisecracks — with him this trip. Everybody loves a good slow-mo of the president dancing. And what would Obama humor be without a good birth certificate joke? Way to bring the laughs, BO. Well, every international trip can't be all giggles and dance moves. The president is seen here with Kenyan leaders, speaking as a leader of the United States to a country whose people and culture he calls his own. We like you when you're feeling groovy, Obama, but you pack a good "serious business" face, too. Coming off a month when SCOTUS passed gay marriage and made all of the progressive parts of the United States happy, Obama seemed to want to share that love with Kenya. Urging them to make changes on social issues and policy, the president also reminded us that he is just a darn good ally.